Churu District lies in the Indian state of Rajasthan. Churu is the administrative headquarters of Churu district. 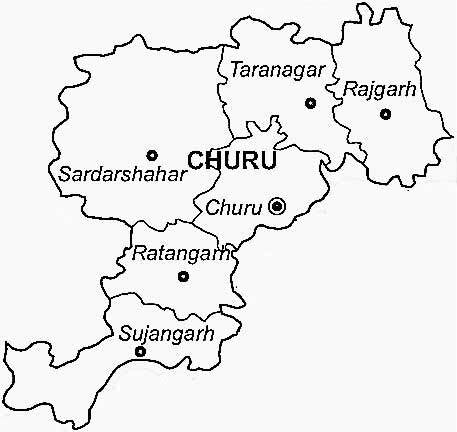 The Churu District has 6 tehsils namely Churu, Taranagar, Ratangarh, Rajgarh, Sujangarh and Sardarshahar.Churu district was a part of the state of Bikaner till India gained Independence. It came to existence only in the year 1948. The major towns of the district are Sujangarh, Ratangarh, Rajgarh and Bidasar. Tal Chhapar Sanctuary, blackbuck sanctuary, having more than 1680 black bucks and migratory birds, is the major attraction for wild life enthusiasts. Churu is located in North-East Rajasthan, with Sri Ganganagar on the North, Sikar, Jhunjhunu and Hissar to its East, Nagaur on its South and Bikaner to its East. Churu district has hot climate during summers with maximum temperature reaches to 49-50 C. It has cool weather during winters with minimum temperature to -01 C.
Jaipur International Airport is the nearest airport located 189 km from Churu. Churu railway station is well connected to Jaipur and Delhi. R.S.R.T.C runs regular buses to Churu district from various tourist destinations and nearby towns. Thanks Rajkumar for correcting Us !